There's an interesting new blog that has appeared in the wake of Obama's election that will follow "The Obama Foodorama, From Arugula To Waffles. With Ag Policy Commentary, Recipes & Chowbama Gossip." 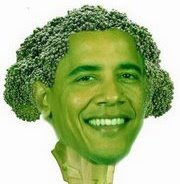 A Daily Diary of The Obama Foodscape, One Byte At A Time.